Happy Thursday everyone... It's our Final reveal day at Newton's Nook. All of the new products will be available in the store tomorrow! 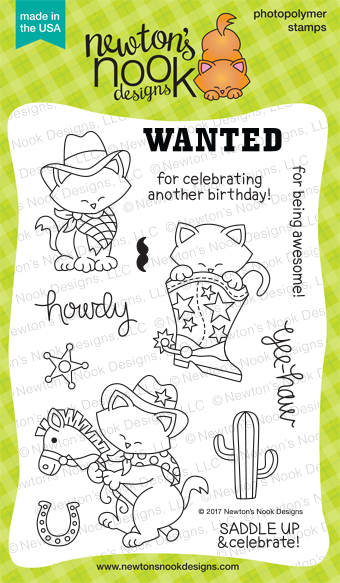 Today we are featuring a new Newton set called Newton Rides West and it's coordinating dies. I started with a piece of Woodgrain Distress paper and added some splashes of Distress Ink to it and then I adhere it to a A2 size card base. I die cut some stars from some Distress cardstock and added some Mustard Seed Distress Ink to them. Once they were dry I added them to the background. I die cut another piece of Distress cardstock and then I wrinkled it up and added some Vintage Photo Distress ink to make it look like old Paper. Once it was dry I ran it through my big shot to flatten it back out some. Then I stamped the sentiments from Newton Rides West. I adhered this piece to the card front with some foam tape. Then I stamped Newton onto some White cardstock and colored him in with Copics. I used the coordinating dies to cut him out and then I adhered him in the center of the poster. I added some White Gel pen for details and a few Sparkling Clear Sequins. This is a really fun set and a must have for your collection! What a darling Wanted poster! Wow, the background to the cowboy is amazing... looks like aged leather!!! Such a fun card! I really like how you positioned the stars and added the splatters. Adorable card! Love the background! So cute with the wanted poster and I like the stars. This is so cute. Newton is adorable in the cowboy hat. Love those gold stars too. A perfect card! The style is perfect for those stamps. 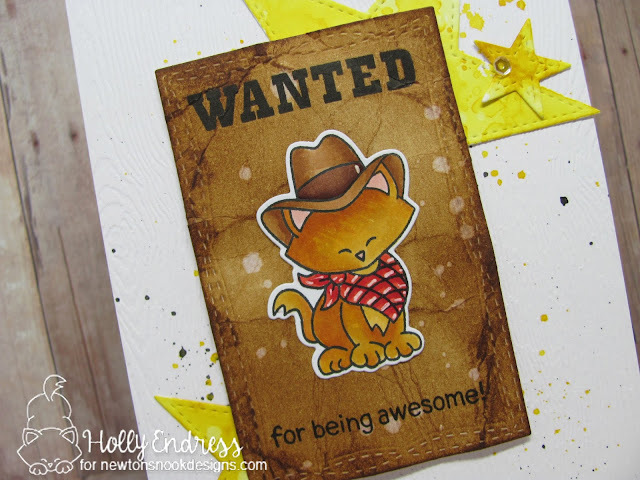 Love the weathered and leather look you gave your wanted poster!!! So cute! your cards is great love the wanted sign. I just have to have this whole release. adorable! 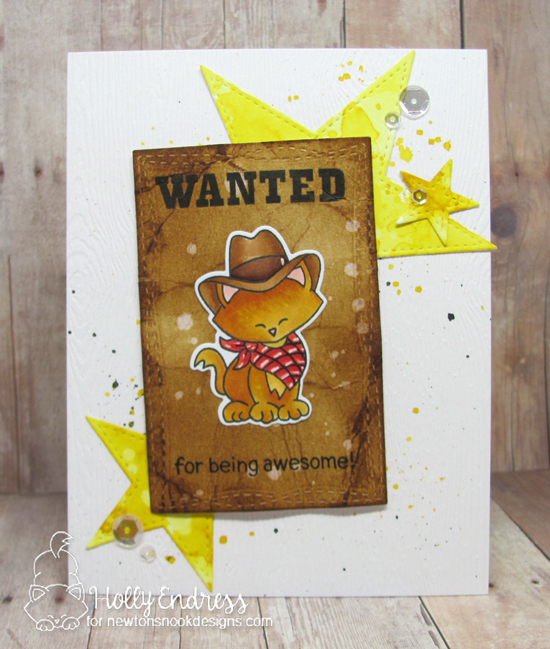 I love the distressing behind the kitty! I love how the star reminds me of a sheriff's badge! Cool card! This is so cute! Love the idea of the wanted poster for Newton. This is such a cute set of stamps and I love your card! There's that rootin' tootin' varmit on the wanted poster! I've been a'lookin' for you. Come to collect the reward you cutie patootie!